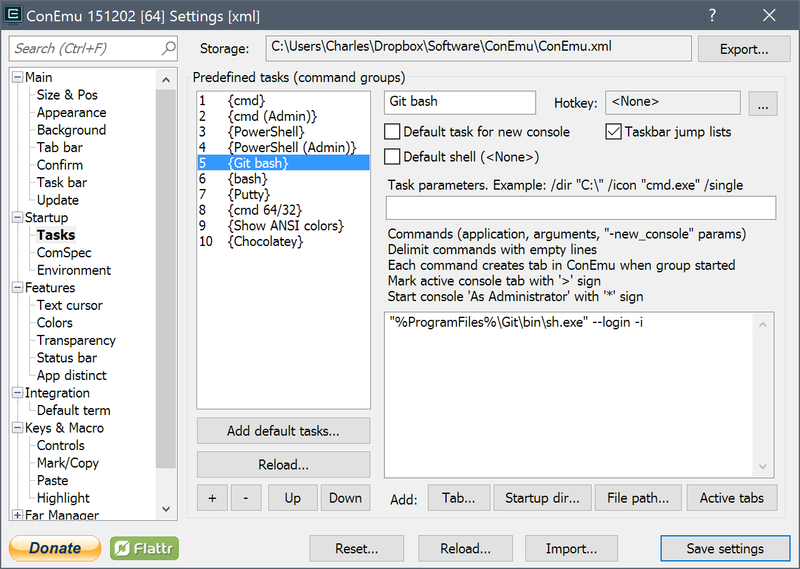 How do I create a right-click context menu entry to open Git Bash at a given folder within ConEmu? See Git Bash Here in Console2 for the equivalent question for Console2. There are a number of ways this can be done in ConEmu as it is so highly configurable, but here's the way I do it. 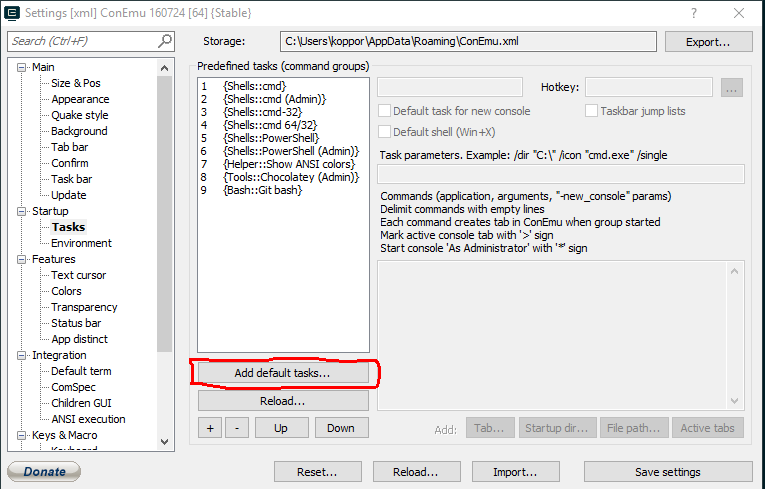 In ConEmu, hit WinAltp to open the settings dialog. This should add an entry in your right-click context menu (complete with icon). In the Command field you can use any of the ConEmu.exe switches (worth checking out for more complete documentation of what you can do - it's pretty powerful). This only seems to work if it's the first tab open, though. I got Portable ConEmu version 150111 in zip archive and had the GiT Bash in tasks just out of the box. As well as some other entries. So there was no need in editing anything at all. Starting with ConEmu Portable .7z downoad and msysgit PortableGit .7z download, I created the following Windows shortcut. Of course adjust your portable path to ConEmu and Git appropriately. "C:\Program Files (x86)\Git\bin\wish.exe" "C:\Program Files (x86)\Git\libexec\git-core\git-gui"
I have on issue and always on close say that one process is running but I think that is because I have zsh inside bash console. Not the answer you're looking for? Browse other questions tagged windows bash git conemu or ask your own question. How do i configure conemu to open a new tab instead of a new window, when run on the command line? 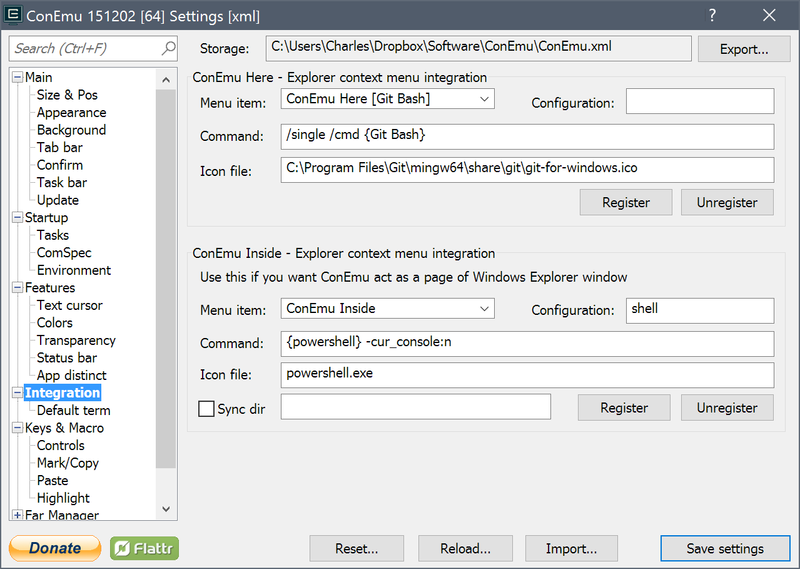 In ConEmu / Cmder, how do you setup ConEmu Here to work with powershell?